No Passive Learning Here - WORDPLAY! WORDPLAY makes grammar studies seem like a day at the waterpark. It is such fun! Author Adam Lehrhaupt personified parts of speech then placed them on a playground to do what kids do. Play hard. Get a little jealous. Bicker a bit. Jockey for social ranking. Take up for each other. And, eventually become good friends. Adam nailed it. Even though illustrator Jared Chapman’s brilliant use of bright primary and secondary colors suggest that the book is suited only for the very young, I think WORDPLAY is beneficial for any student – young or old – who struggles with the fundamentals of grammar. Teachers, WORDPLAY needs to be on your shelves. Trust me on this one. For real. The projects in the Discussion/Activity Guide compliment the active spirit of the story. No passive worksheet coloring in this one. That just wouldn’t be right. Instead, we’ve got kids up and at ‘em, rocking and rolling word cubes, embodying Adam’s personifications by dramatizing the grammatical structure of silly sentences in true Mad Libs fashion. Fun. Fun. Fun. Character Cards serve to keep the crazy cast members somewhat orderly. These cards are simple to make and are super handy when lining up young actors to participate in an impromptu performance. The WORDPLAY character cards are labeled and color-coded to represent each role. All a teacher needs to do is trim around the borders, punch a couple of holes in designated spots, and then secure a bit of yarn on the card to create a hanging tag. Kids love these things. Teachers will, too. If you’d rather have your students make their own Character Cards, click here to download blank copies. Use them to create a cast for Reader’s Theater productions, imaginative play activities, and anything else you might think of. Let the kids illustrate them; choosing colors and shapes that best represent their characters’ true nature. No passive worksheet coloring, right? Never! Instead, taking Adam and Jared's lead, let’s make word play lively and fun! Reading Nancy Bo Flood’s insightful Water Runs Through This Book spun me back to a delightful memory of my classroom teaching experience I enjoyed years ago. We had scheduled an environmental agency in Dallas to present a half-day workshop session. Their mission was to teach water conservation, which sounded like a fine way to spend the better part of the morning. As it turned out, their program was unforgettable! The group brought a game with them, an interactive one that had the kids hopping all around the room like raindrops on a rooftop. The game was chaotic and engaging and FUN! I had a blast and the kids did, too. Flood’s book reminded me of the game we played, a game illustrating the agelessness of the water molecule. That day we learned that one molecule of water can transform from being a snowflake, to a dinosaur’s dribble, and then show up shooting itself out of a water hose! How cool is that? An adaptation of that incredible game, and a few other activities, are included in the Project and Activity Guide created to compliment the fascinating facts featured in Water Runs Through This Book. Ultimately though, what makes this book a must-read is Flood’s blend of factual data with her signature poetic touch – a combination that will keep young readers deliciously engaged in the miraculously wondrous world of water for eternity and beyond. Buy it. Read it Enjoy it. Fair warning, though. Keep your umbrella close by. You just might need it. Reading Guides: Align with Academic Standards? Why Bother? Well, if you’ve got some alignment-worthy activities in the guide, why wouldn’t you? The kicker is to offer skill-based lessons. The real deal. Activities that stretch their minds a little . . . or maybe a whole lot! To inspire kids to reason. To challenge. To grow! The purpose behind aligning guides with academic standards is to document opportunities to practice demonstrating the understanding of a skill. Whether learning how to cite dialogue, considering the interrelationships of habitat’s flora and fauna, or developing the confidence to present their personal views on a sticky topic – if you’re offering these types of valuable learning experiences in your guides and presentations, align them! The goals of well-crafted reading guides are to compliment stories by capturing the imagination of a reader, enticing them into a bit of painless and productive documented skill practice, and maybe have some fun while doing so! Aligning your projects with the standards simply validate the value you’re already offering. So go for it! Reading Guides: When Do You Need One? Any time is the right time to have Reading Guide created. Whether you’re a multi-published phenom or birthing your first book baby, if you’re hoping to land a niche in the school and library market, it’s time to think about adding a reading guide to your marketing platform. Speaking of a multi-published phenom, meet author Lisa Wheeler. She’s published well over 30 books and keeps on keeping on. Because Lisa desired to give her Dino-Sports series a little promotional boost, we created a joint CCSS-aligned activity guide for six of the titles. She was wise to do so, in that these books offer more depth than the covers suggest. The guide proves it. Not only do her Dino-Sports series feature hot and fast game action, Lisa presents elements of history, mathematics, geometry, and athletic nomenclature in each book. The guide should help keep her Dino-Sports series on the winning roster for a long time! Score! Many debut authors are crafting guides for their new releases well before advanced reader’s copies hit their front porch. Debut author and master teacher Dianne White created a sensational Teaching Guide for her stunning picture book, Blue on Blue. Her years of experience in the classroom came in handy when it came to developing this well-crafted, CCSS-aligned Teaching Guide. She’s made an instructional tool that meets the needs of kindergarteners through 8th grade in clever and creative ways. Best of all, Dianne’s love for poetry resonates in each lesson. This debut author knows what she is doing and she is doing it well. As you can see, it’s never too late or too early to add a well-crafted Reading Guide to your marketing platform. Wherever you are in the publishing game, think about adding a quality guide to your publicity tool box. It just might give your book the promotional boost it deserves. Reading Guides: Who Needs Them? Teacher Guides. Activity Guides. Academic Guides. Project Guides. Reading Guides. Whatever the reference, offering some sort of supplemental resource like one these has become a standard in book’s promotional package today. Quality book guides come in all shapes and sizes – from in-depth, historical or scientific studies to light-hearted games and crafting projects. But how can authors, illustrators, and editors begin to know what type of guide best suits their stories and the market? Are reading guides really necessary? Who needs these things, anyway? Educators need them. Despite curriculum constraints, the fact that a book’s content is rich enough to support a well-crafted guide speaks volumes about the author’s merit. Texas author Cory Putman Oakes tells the story that a principal in California based his decision to book her for a school visit on the Educator Guide created for her middle grade novel. She said the principal set her darling Dinosaur Boy on the desk, began thumbing through the guide, and responded, “When can she come out?” He knew Cory had what it takes to reach his kids. Her guide proved it. Librarians need book guides. Be it a list of well-crafted discussion questions or a fun packet of useful read-along projects, librarians delight in these tools. They’re perpetually on the hunt for quality, supplemental reading resources. In fact, the first guide I created was a result of a librarian suggesting that author Jennifer Ziegler have one made for her incredible How Not to be Popular – a 2010 IRA YA Choices and Lone Star Reading List winner. Way to go, Jennie! Lastly, depending on marketing strategies, you need a guide – a quality, well-crafted one. A thoughtful, entertaining supplemental guide highlighting all of the hard work you’ve put into the project. One that leads readers to deeper connection with your story and you. One that demonstrates your book’s potential for lasting appeal to educators, librarians, and all of the important gatekeepers in between. All this to be said, if your book is one that you hope will have lasting appeal in the school and library market, take a moment to consider your marketing strategy. You just might need to include a reading guide of some kind to entice educators and librarians to take a longer look at your fine work. I began making guides for folks before the Common Core was cool. Even then, I was creating hands-on, project-based content that is entertaining, yet academically sound - the kind of stuff that both the kids and the folks that care for them would appreciate, and have been enjoying every minute of doing so for a long, long time. Recently, author Kelly Bennett asked if I would go back and align all of the guides I previously made for her with the Common Core State Standards. I was glad for this opportunity as I would be able to revisit the work I had done almost three years ago in the light of present-day standards. That's kind of exciting, in a nerdy sort of way. Kelly's Your Mommy was Just like You is just as charming as I remember it being. I love the way it celebrates humanity, in all it's messy forms. In it, tales of a mother's childhood are told to a child. The grown up is presented as an awkward, fantasy-loving, mistake-making kid. This book brings the "nobody's perfect, everybody has an off day" message home, loud and clear. I encourage you to read this delightful book. Review the guide, too, if you'd like. There are a couple activities in there that will make your Saturday simply delightful, on being creating a Daisy Chain, as demonstrated in the video below. This will be my second Michigan autumn. The vivid colors of the changing leaves, brilliant sunsets, and the rosy-red cheeked children continue to make me smile. Everyday is a celebration of change and color. So, this week, I'd like to focus on a guide I made for Tameka Fryer Brown's charming my cold plum lemon pie bluesy mood. The story explores the connection of the change of mood and its corresponding color. This book is a tribute to sibling rival survival and the tenacity it takes to do so. Folks, let me say that the story is lively, entertaining, and very clever. However, if you take a close look at the connection of theme and art, there is a whole lot of shaking going on. It's deep. Really deep. That being said, the guide consists of discussion questions, writing prompts, and basic color theory lessons that lead the reader to an intimate awareness of how color affects and/or reflects emotions. 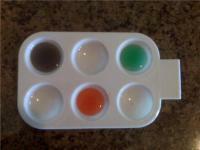 One of the most rudimentary-yet-satisfactory activities presented in the guide is Color Mixing. In it, the child experiences the joy of transposing primary colors into secondary and tertiary just by the drip of an eye dropper. It's a very simple activity that lends itself to some profound results. I encourage you, on this blustery autumn weekend, to take a look at this guide. Better yet, check outmy cold plum lemon pie bluesy mood, the book that inspired the lessons within. Simple Saturday has returned - new and improved! Check out this video inspired by Kersten Hamilton's most awesome Gadgets and Gears series. The robotic hand activity featured in the video below is part of the guide created for her newest book in the series, Ire of Iron Claw, which will hit the market in July. In the meantime, start reading the book that started all the buzz, The Mesmer Menace. While you're at it, check out the cool educator's guide that was created to compliment that book! Y'all, this series is PERFECT for the bright child who owns a love of language, suspense, drama, and science! Just thinking about it makes me want to do a little hand jive! Synopsis: Everyone knows the dinosaur gene skips a generation. So it isn’t a complete surprise when Sawyer sprouts spikes and a tail before the start of fifth grade. After all, his grandfather was part stegosaurus. Despite the Principal’s Zero Tolerance Policy, Sawyer becomes a bully magnet, befriended only by Elliot aka “Gigantor” and the weird new girl. When the bullies start disappearing, Sawyer is relieved—until he discovers a secret about the principal that’s more shocking than Dino DNA. The bullies are in for a galactically horrible fate…and it’s up to Sawyer and his friends to rescue them. Discussion & Activity Guide Download: Guide consists of discussion questions, a word scramble puzzle, a point-of-view writing project, and a guided research activity - all aligned with the Common Core State Standards. A paper plate puppet unearthed from the Simple Saturday archives of old.Back in 2009, the sheer delight of creating simple, entertaining activities for the young and old alike birthed this website. Be it a science experiment or a messy arts and craft something or other, the original Simple Saturday premise was to encourage folks to stop by and enjoy a little crafting fun together. In a way, each original blog post could be considered as an activity guide – a quick explanation about a fun little project to do in a short amount of time. Activity guides serve as the perfect piece of promotional panache. Short. Inexpensive. To the point. Fun. And, many offer games and follow-up lessons that can be aligned with those all empowering academic standards. A one-stop shop, if you ask me. Author Cynthia Lui knows all about the power of the Activity Guide. 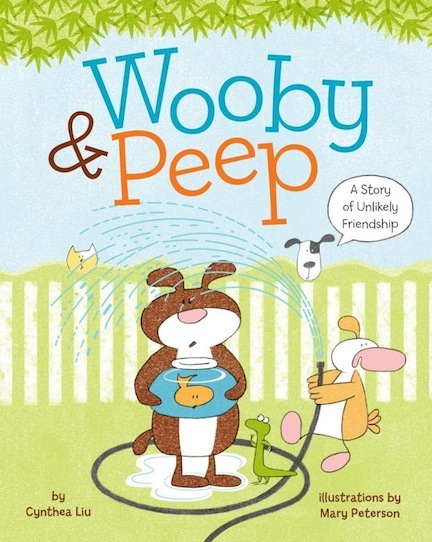 When she contacted me to make a Comprehensive Guide and a Readers’ Theatre script for her darling Wooby and Peep: A Story of an Unlikely Friendship, I did a little poking around on her website to discover she already had some spiffy Activity Guides posted there. It seems that she and illustrator Mary Peterson had partnered up to create marionette-like cut-outs to print and play with. These lend themselves perfectly to be used as puppets in the Readers’ Theatre! Nice work, Cynthia and Mary! I still hear the Saturday call of the glue gun and have a few plans to create something simple and new. In fact, I got a stash of paper towel rolls piling up in the basement ready and waiting to be crafted with. All I need are some magnets, a couple of thin wooden dowels, poster board, some tempera paint, and YOU! Intrigued? Well then, come back soon and let’s have some Simple Saturday fun together, like old times. Click on image to access Science at PPPST.com - PowerPoint presentations for all ages!Famed author Clarence Day once said, “Information’s pretty thin stuff unless it’s mixed with experience.” I think Clarence would have been pleased with the experiential hoopla happening in my prior classroom. My classroom’s science shelf was lined with informative botany, zoology, anatomy, chemistry, taxonomy, biology, and simple machine packets, thick with the promise of splendor for all of us to consider! I have to say that not all, but plenty of our experiments were busts. And, like real scientists do, when that happened, we pulled back, asked questions, considered our data, and try, tried again until we got it right. Together, we experienced the scientific method on a shoestring! The key word in Clarence’s quote is “experience.” He didn’t say “testing” or “quizzing.” Instead, he was referring involvement, participation, and understanding. Mr. Day is talking about the need for active learning, the focus that helps to create the best kind of supplemental guide for a math or science related book. Click on image and buy the book!!!! 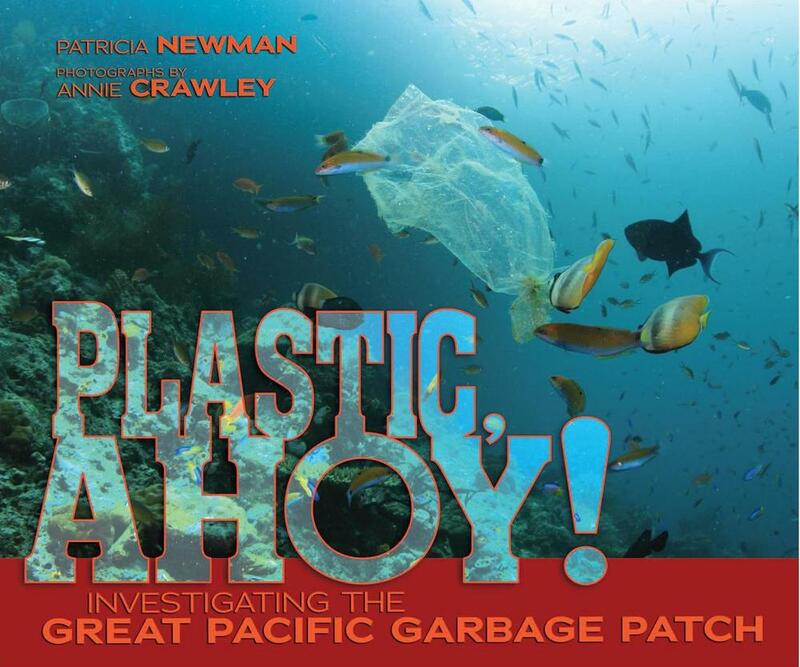 !The guide created for Patricia Newman’s latest, Plastic Ahoy! : Investigating The Great Pacific Garbage Patch, serves as an effective example of experiencing information. Newman crafted this compelling book as if it were a scientific quest to discover the phenomenon known as gyres - large systems of rotating ocean currents consisting of a heavy concentration of trashed plastic threatening to destroy ocean life. Plastic Ahoy! : Investigating The Great Pacific Garbage Patch allows the reader to join with a team of graduate students and become trash detectives by hypothesizing what the effects of plastic garbage might have on the future of the earth’s oceans. In the guide, the lesson entitled The Summary of the Scientific Method ( pg. 13) serves as an effective example of leading the reader to discover answers to their own burning questions. Kids can use this step-by-step method to formulate a hypothesis and then generate a plan to prove it. Perhaps, much like my days in the classroom, though some of their experiments might turn out to be busts; they’ll have a grand time scientifically trying them over and over again until they get it right. I only wish I could be here to join in the fun! Suitable for all genres, Discussion Guides serve to guide understanding of not only the text, but its emotional connection with the reader. They contain interesting, probing, and enlightening questions that get the reader thinking and talking. These guides and be quite short, perhaps ten or so questions long, or can be several pages in length, depending on the needs and intent of the publication. Quite often the questions posed serve as effective writing prompts, leading to a deeper study of a variety of topics. When a reader connects with the story, they are more likely to be led through analysis of all sorts of literary elements. Character motivation can be closely considered. Plot twists can be pointed out. Structure can be scrutinized. Voice and point-of-view can be made visible. In short, Discussion Guides keep kids and teachers talk-talk-talking about a book—an author’s and librarian’s dream. The Discussion Guide created for The Secret Side of Empty is an example of an in-depth guide, which works perfectly for this fascinating YA. In it, the protagonist struggles with the limitations her illegal status brings. She cannot go to college. She cannot work. The forecast for her life after high school is ‘empty.’ And so, she emotionally drops out. She drinks, experiments with drugs, and contemplates suicide. Much fodder for deep discussion, don't you think? In-depth writing prompts have been added to this Discussion Guide, as well. Students are asked to express themselves through short narratives, informative essays, and opinion pieces. While not all Discussion Guides include specific prompts such as these, the well-developed questions in most can be utilized in this way. And, yes, the questions and writing prompts for this Discussion Guide created for The Secret Side of Empty have been aligned with the Common Core State Standards. This not only validates the acts of questioning, discussion, and written expression, the alignment will hopefully help Maria Andreu's great work find a lasting place on the curriculum shelf. That's the goal, right? A few months ago, I asked some dear friends to help me define the skill set that I bring to the kid-lit table. After several insightful email exchanges, the concept you see on the left was conceived...and I love it! I'm a kinesthetic learner. My mind works in a concrete way. I see patterns and structures in story. I can visualize braiding, layering, echoing, and the like in vivid color and line - ways that can be creatively communicated to others in my discussion and activity guides. In interpreting my vision, I connect readers with story. Holding closely with the slogan, Keeping your books in the hands of the educator and the heart of the child, striving to guide a kid's learning process in a non-didactic, entertaining manner. It is by intentional design that 'education' is at the apex of the logo's equilateral pencil triangle. I believe, now more than ever, we authors and illustrators have the greatest impact on education. Our innate passion for story and love of young readers is what can be transferred as enthusiasm for learning process. Literary elements we hold dear - plot, theme, premise, tension, climax, a satisfying resolution, to name a few - is the stuff that kids need to hear about from folks that they admire - writers and illustrators. US! I don't pretend to have all the answers to eliminate test anxiety, stress in the classroom, or teacher burnout. I wish I did, but I don't. But what I do know how to do is connect a kid to a story in a way that they will learn something. And, that's pretty cool...don't you think? The tale of Under the Freedom Tree is a moving historical account of bravery and tenacity and inner conviction. Susan VanHecke’s beautifully written account of three runaway slaves who became contraband of war is the type of story that stays with a reader long after the final page is turned. And, illustrator London Ladd’s heartfelt renditions of tragedy and triumph breathe life into the bold acts that ultimately played convincing roles in Lincoln’s decision to craft the Emancipation Proclamation. Folks, it was and is a true honor to create a Discussion and Activity Guide for this incredible story. It’s a keeper, for certain. Mary Smith Peake - my hero!!!! !There are number of critical players in Under the Freedom Tree, people who changed history because of their beliefs in civil rights for all. For instance, there are Frank Baker, James Townsend, and Shepard Mallory – the three runaway slaves who risked their lives to find asylum at Fort Monroe, Virginia. Then, there’s General Benjamin Butler of the Union Army who deemed these men as ‘chattel’ and refused to return them to Confederate Army. And my most favorite person in the story – one that I’ve come to love – is Mary Smith Peake, the heroic teacher who courageously taught the children of the Slabtown community to read under the shade of a broad-limbed Live Oak – The Freedom Tree. The guide is crafted in such a way that students will be able to retell this poignant story time and time again. It is my hope that, through the writing, matching, and historical sequencing activities offered in the guide, this remarkable recounting of the courageous individuals introduced in Under the Freedom Tree are celebrated forever. Note! The guide created for UNDER THE FREEDOM TREE has been included as a part of a review for the School Library Journal's Booktalks to Go: History in Picture Books. This amazing book is keeping some great company with several other fantastic titles. Now that's something to be thankful for, isn't it? The Graphic Organizer - A God-Send! Graphic organizers are some of the most beneficial tools around to teach complicated literary concepts such as theme, text structure, chronology, and sequencing - to name just a few. Also known as knowledge maps, cognitive organizers, or concept diagrams – graphic organizers provide a visual opportunity to grasp complex learning and instruction. And, they’re fun to use! Here's a graphic organizer made to compliment a lesson in P. J. Hoover's school visit programming document. Click on the image and see how a graphic organizer can be used!Maureen McLaughlin and Brenda J. Overturf have joined forces to create an excellent e-book collection of graphic organizers that address both the narrative and informational text CCSS standards. The collection is entitled The Common Core: Graphic Organizers for Teaching K-12 Students to Meet the Reading Standards. All of the organizers are developed to support students’ thinking process, and each is sensational. · Clearly explain how the organizer works. · Demonstrate how to use it. · Engage students in guided practice. · Allow students to practice using the graphic organizer on their own. · Finally, engage students in reflection regarding how to use the organizer and in the topics and/or skills that they learned. If you are an educator looking for ways to help your students grasp the expectations of Common Core Reading Standards 1 to 10, consider downloading this insightful e-book. It is loaded with plenty of strand-specific, power-packed graphic organizers, each complete with clear definitions stating the purpose and intent. I particularly like the ones created to guide the understanding of informational text structures. Then again, I’m kinda geeky that way! Big Pirate Pete says, "Click here and buy the book - or else! "Got a lively, entertaining, and not-so-quiet story for you – NO PIRATES ALLOWED! Said Library Lou written by Michigan author Rhonda Gowler Greene and illustrated by Brian Ajhar. 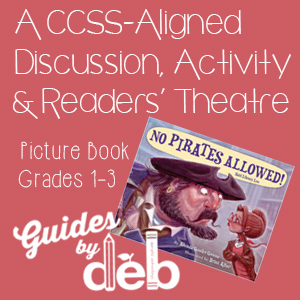 I tell you, the experience of creating a Readers’ Theatre script and a Discussion/Activity Guide for this picture book was like digging through a pirate’s chest full of jewels. This story has it all – danger, intrigue, conflict, and a slight suggestion of a love interest at the end. In it, Big Pirate Pete is in search of treasure. 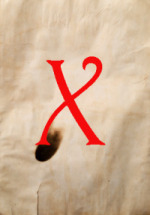 According to his map, X marks the spot, and the spot is located smack-dab in the middle of tiny Library Lou’s domain – the Seabreezy Library. Pete is boisterous and tries to intimidate Lou. Undaunted and unflappable, Lou is firm with Pete. She promises that she will lead him to the treasure, after he complies with a few directives (Some of which are hilarious). In the end, Pete discovers that true treasure lies in books, a bounty worth more than pirate’s booty! One of the many aspects that made working this projectsuch funisthat Brian generously allowed me to use his illustrations to compliment the guide and the script. I fell in love with his style, the way he plays with size and color and expression. Fantastic! I so strongly encourage you to read this great story and then check out the guide and script – most especially, take note of the character cut-outs provided as a part of the diorama foldable activity. They’re great! Better yet, gather up a cast of kids and film a production of NO PIRATES ALLOWED! Said Library Lou. Rhonda, Brian, and I would love to see it. Lights! Camera! Action! Arrrrrrrrr, matey! Click on the image to order the book!As I’ve said many times before, each guide I create offers a unique opportunity to learn something wonderfully new. Creating book guides for authors and illustrators also grant me the great pleasure of getting to know the individuals on a more personal level. 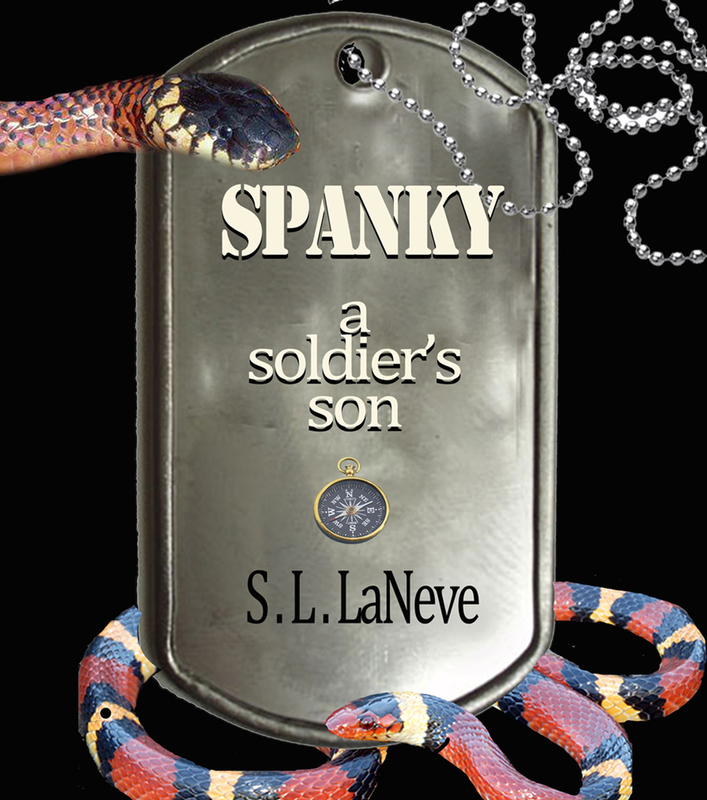 Such was the great experience I had creating a guide for author Sue LaNeve’s award-winning Spanky: A Soldier’s Son. It’s no surprise that LaNeve’s novel earned a bronze medal from the 2013 Military Writers Society. It’s that good. I can attest for it! Click here to access the guide.The story is about a boy whose father is deployed to Afghanistan, leaving Spanky and his broken-hearted mother to fend for themselves in a new community. His father’s departing words were, “Son, make me proud.” These words haunt him as he deals with bullies, self-doubt, and adult-like responsibilities. Eventually, Spanky begins to trust and believe in himself by acknowledging the leadership skills he holds within. In the end, he makes his father proud – and then some. The story is great. Sue is fantastic. But, the aspect I enjoyed most about this project was partnering with Sue’s mom, Audrey W. Lederman, M Ed., as a consultant for the guide’s contents. You see, Audrey once worked with the talented and gifted. She was a true gift to me, I’ll tell you. Her insights and ideas were astounding! Sue and Audrey - now there's a mother/daughter team that can't be beat. I’ve been teaching long enough to know that there are times when the student has more to teach than the instructor does. As a Montessorian, moments like these are sheer bliss. They mean we’ve worked ourselves out of a job. The students have become independent, which is the ultimate goal of the classroom experience and in life. 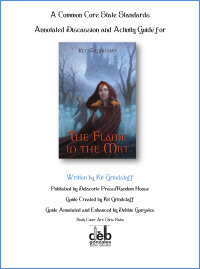 Working with the lovely and talented Kit Grindstaff on her Teacher’s Guide for her most incredible fantasy The Flame in the Mist was one of those blissful "forging toward independence" experiences. 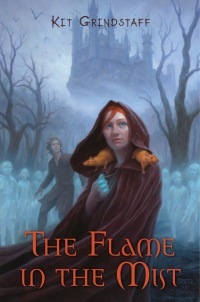 Kit describes The Flame in the Mist as the story of courageous and fiery-headed Jemma, who, with the help of two magical golden rats and her friend Digby, has a dangerous destiny to fulfill: to stop the evil rulers of her country, and the mist and misery they create. Whoa! Stop right there. Magical rats. Evil rulers. Mist and misery. Shoot…I’m chomping at the bit to make a guide for an awesome story like this one. But alas, fair Kit has a plan of her own – a good one, too. Kit created her own guide that far surpasses anything that I could have dared to attempt making – an astounding 35 page feat of splendor comprised of chapter-by-chapter analysis, historical setting, a summary of Medieval times facts, a cool section entitled “Nursery Rhymes – Innocent or Creepy”, character analysis done in marvelously creative way, and even a criss-cross puzzle! All she needed me to do was to pretty it up a little and add the Core Curriculum State Standards annotations to it. She did the heavy lifting. I merely cheered her on. I became enraptured by the story as I poured over the guide she created. So much so, I dropped a bomb of a hint that I wanted to read the book. Kit graciously sent me a copy in which she inscribed, “Thank you for helping me rock the schools with Jemma and the Ratresses.” No….sweet, Kit. I think you’ve done it all by yourself! And, I’ve have to say, that I’m mighty proud of YOU! 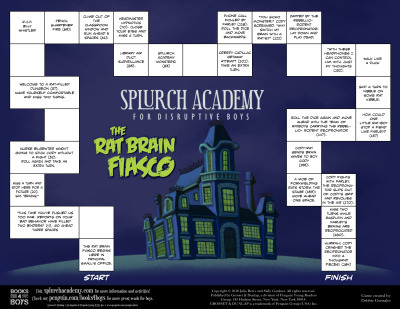 Click on the image to buy the bookTo continue with the activity guide throw-back theme of late, let me tell you about this great game board I made for Julie Berry’s hilarious Splurch Academy for Disruptive Boys: The Rat Brain Fiasco quite some time ago. I made the guts of the game. She and her sister made it pretty – or rather, scary. The Splurch Academy series is far from high fantasy, my friends. It’s just an example of some light-hearted, goofy, all-boy, brain-sucking fun. In it, protagonist Cody Mack, a mildy ill-mannered boy, is sent to a school run by a faculty of monsters! At first they work hard to conceal their fangs by posing as a polite principal and his studious staff. But then, like any horror story worth its blood, Cody uncovers clues that a boy was killed at the school and scrambles to avoid meeting the same demise. Click on the image to download the game, if you dare!The game is constructed by tracing plot points of the book, most are cited from the text and are as ghoulish as ghoulish can be. I like to imagine some wiry, seven-year-old boy’s grubby fingers flipping through the pages, intent upon relishing a re-read of the story's sloppy, slurpy gore. Delicious! And, the best part is that the plot point game is inexpensive, easily reproduced, and distributed.